SS+K is launching its first work for FreshDirect since landing the food delivery brand's creative business. The ads, which break Monday and will appear on trains and outdoor kiosks, use the line, "We go out of our way to bring you great." A bigger brand campaign—with digital ads, online video, social media marketing and events—is expected in the first quarter of next year. SS+K landed the account last month after a review. The other contenders could not be determined. Chief consumer officer Jodi Kahn, the former president of NBC Universal's iVillage who joined FreshDirect in December 2013, led the search. As lead agency, SS+K succeeds another New York shop, DiMassimoGoldstein, which had handled the brand since 2012. 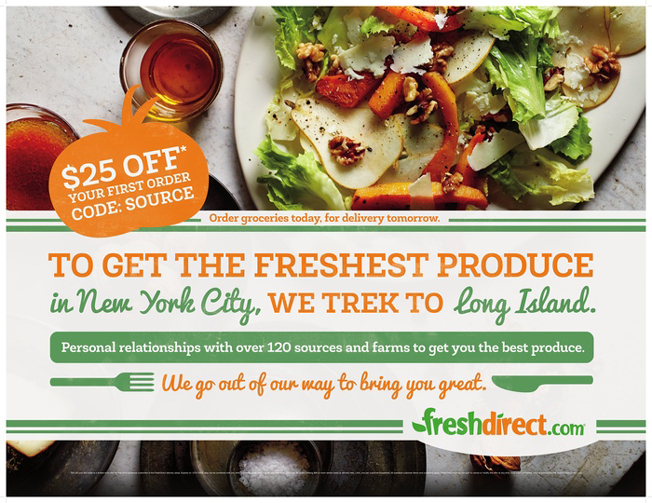 SS+K co-founder Lenny Stern described FreshDirect as a "category-defining brand with a higher purpose." Past media spending on the brand has been modest—less than $2 million last year, according to Kantar Media—but is expected to rise a bit under the new agency. SS+K's latest win follows assignments from HBO, The New Yorker, Jackson Hewitt Tax Service, and E-Trade that arrived earlier this year.